He was a famous trumpet man from out Chicago way. He had a boogie style that no one else could play. He was the top man at his craft, but his number came up, and he was gone in the draft. He’s in the army now, ablowing reveille. He’s the boogie woogie bugle boy of Company B. It is probably safe to say at the top of the charts was the high stepping, can’t stand still when hearing it, “Boogie Woogie Bugle Boy of Company B.” Composed by Don Raye and Hughie Prince early in 1941 and later made popular by the Andrew Sisters, the song had the biggest unplanned promotional sendoff of all time. The United States officially entered WWII. Just as the titled bugle boy in the song, countless more young men suddenly found themselves in the military service. The song was introduced in the Abbott and Costello movie “Buck Privates,” earning an Academy Award. All of the previous information is documented facts. What follows is much less known. While the song did not come along until 1941, there actually was a “Bugle Boy of Company B” way before then. What’s more is he would later call Claremore as his home. Lee F. Gilstrap was a medal winning bugler in Company B way before the song was written. 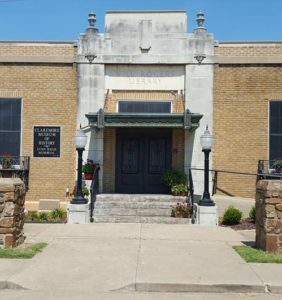 As a boy growing up in Chandler, Oklahoma, Lee enjoyed hanging out at the National Guard armory. His father Harry Gilstrap was a major. Lee quickly became a rifle marksman and would go on hikes and encampments with the Guard members. This early training proved to be useful. At age 14, he accompanied his father to New Mexico when the guard unit was assigned to stop Pancho Villa’s recurring raids into the United States. Two years later telling them he was a year older, the 16-year-old Lee enlisted in the U. S. Army and was quickly sent to Europe to take part in World War I. On October 8, 1918, the young Oklahoman was the bugler for Company B of the 142 Regiment of the 36th Infantry Division. His company was taking on heavy resistance from German machine gunners on a hill near St. Etienne, France. Deadly mustard gas was also being used. When the soldier next to him went down wounded, Lee tossed his bugle away and picked up the fallen rifle. According to official reports later, Lee made several trips carrying his wounded comrades to the aid station. This continued until he was shot by a sniper. Injured only slightly, he was able to capture the one who shot him. He promptly put his prisoner to work, forcing the German to help him get the wounded U. S. soldiers back to safety. Still the casualty numbers kept climbing. Needing more help, the bugle-boy-now-rifle-toting-soldier went to work. He captured 12 more Germans. At gun point Lee forced them to carry on with the rescue missions. Three of the Germans were killed during the process. In addition to aiding his fallen wounded, Lee carried messages between the front fighting squads. Several times he ignored officers’ warnings to stay under cover. His effort didn’t end until he was injured a second time. Lee was badly burned by gas from shellfire. He spent the five following months in English hospitals. For his actions that day the bugle boy was presented the Army Distinguished Service Cross, the second highest medal awarded. He was the youngest recipient at age 17. To this day his rank remains as bugler on the list of DSC winners. His service to his country wasn’t over. Following the “Great War” he returned to Oklahoma and remained in the National Guard. Enrolling in college at Oklahoma A & M still as a teenager, Lee became president of his fraternity, student senate, and his junior class. He played basketball and served as a trainer for the Cowboy football team. A teaching career followed. In 1927 he joined the staff of the Oklahoma Military Academy. He now called Claremore home. He soon met and married Doris Hays. Both were outstanding role models to both the school and community. When World War II started, Lee answered his country’s call again. He served with the 45th Division as an executive officer of the European Theater provost marshal. He retired in 1946 with the rank of Colonel. From Bugle Boy to Colonel, his military career was finally behind. Lee returned to Oklahoma A & M (soon to be Oklahoma State University) and taught speech. He also served a faculty advisor to a fraternity and the student senate. Lee F. Gilstrap hadn’t forgotten Claremore. This is where he returned for his retirement years. Remembered for his popular manner and bearing as an OMA instructor, he remained a leading citizen until his death in 1987. Okay, our Colonel Gilstrap was probably not the Bugle Boy in the famous song. He didn’t come from “…out Chicago way.” At least two other musicians are believed to have been the writers’ initial pattern.